Initially, we want to discuss the influence of a bypass on only one treatment plant. The lower line in Fig. 13.12 shows the wastewater stream with an influent concentration cin, for example, in g L-1 COD and a lower flow rate Q. Fig. 13.12 Concentration/ mass flow rate diagram for one treatment plant with bypass. An effluent concentration ce is given. The rest of the flow rate flows through the bypass. The concentration cout before mixing with the bypass wastewater is relative low owing to the relative high mean retention time inside the reactor. With decreasing bypass, cout increases and finally reaches coutmax, the highest allowed effluent concentration, which should not be exceeded. coutmax can be calculated using a mass balance and the given concentration ce. In the next step, several treatment plants either without bypass (Fig. 13.11b) or with bypass (Fig. 13.11c) are connected in parallel. 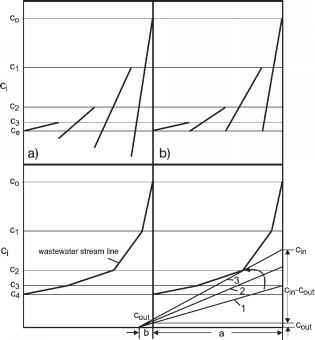 The concentration/mass flow rate diagrams for four plants are presented in Fig. 13.13. In Fig. 13.13a, the effluent concentrations are lower than ce in three of the four plants because all the wastewater goes directly through the treatment plants. By adjusting bypass flow rates, the situation presented in Fig. 13.13b can be obtained: the effluent concentrations in all four treatment systems agree at ce. Fig. 13.13 Decentralized effluent pretreatment process in the concentration/mass flow rate diagram. (a) (Treatment in) parallel plants, partly with lower effluent concentration than the required ce. (b) (Treatment in) parallel plants, all with the required effluent concentrations ce. (c) (Treatment by) using the parallel/series portion and the bypasses of all four plants. 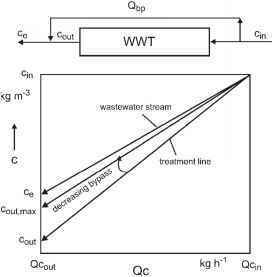 (d) Construction of the treatment lines for higher flow rates (curve 1 and curve 2) and for the lowest possible flow rate Q (curve 3). Up to here, all WWTs have been connected in parallel. Now, we wish to combine the lowest points in Fig. 13.13b by connecting the highest point of the first plant with the lowest point of the second plant. To do this, we will change: (a) the parallel/series portion and (b) the bypass of all four plants. 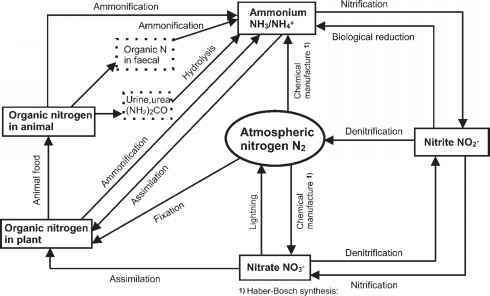 This changes the flow rates in each of the plants as well as the concentrations of the influent wastewater, giving c1, c2, c3 and c4 (Fig. 13.13c).